"Knightmare Goblin", "Gryphon", "Phoenix", "Unicorn", and "Cerberus" fighting "Beckoned by the World Chalice" while "Mekk-Knight Avram" and "World Chalice Guardragon" pursue "Knightmare Corruptor Iblee"; in the artwork of "World Legacy's Nightmare"
"Knightmare", known as "Troymare" (トロイメア, Toroimea) in the OCG, is an archetype that debuted in Flames of Destruction. The archetype is related to, and supported by, the "World Legacy" archetype and is focused on Link Summons and being co-linked. All of the archetype's Link Monsters so far are Fiend. 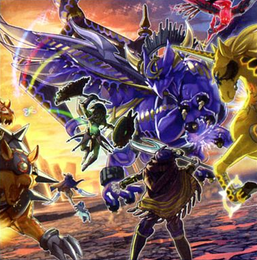 The "Knightmare" Link monsters have different Attributes and the ones with the four elemental Attributes have a color scheme that corresponds to that Attribute. Their bodies are comprised of a combination of a glowing translucent substance and silvery metallic armor with a gold and black design etched into them. Parts of their armoring and bodies also appear to be made out of charred or blackened junk, mostly weapons, that resemble trashed remains of the "Mekk-Knight" monsters' armors, remodelled into resembling the namesake mythologic creatures. All "Knightmare" monsters, except "Orcust Knightmare", also have a musical symbol somewhere on their body. The main goal of this archetype is to build a field with as many co-linked monsters as possible, to the point of achieving a state of Extra Link. All the "Knightmare" Link monsters revealed so far have effects that activate when they are Link Summoned, by the cost of 1 card in the player's hand, and they allow the player to draw 1 card if they were co-linked when those effects were activated; also, they have Continuous Effects that are either benefit monsters that are co-linked or burden monsters that are not. Since they do not require Link Materials of specific Type(s) or Attribute(s), any engine capable of swarming the field with monsters with different names may help Link Summon them. Monsters that are already used in Link-oriented strategies, such as "Cyberse Gadget", "Stack Reviver", "Bitrooper", and the "Gouki" archetypes can be helpful. Due to their first effect requiring a discard as a cost, they may have synergy with "Fabled" monsters; also, they tend to allow the player to control the field by achieving an Extra Link and disabling the opponent from Special Summon monsters from the Extra Deck. This goal can be further deepened by Special Summoning "Knightmare Corruptor Iblee" to the opponent's field and preventing the opponent from disrupting the "Knightmare" player's strategy by Special Summoning a "Kaiju" monster, for example. WATER Special Summons a "Knightmare" monster from the Main Deck. Monsters on the field lose 1000 ATK/DEF, unless they are co-linked. FIRE Destroys an opponent's Spell/Trap Card. Co-linked monsters on its controller's field cannot be destroyed by battle. WIND Allows 1 additional Normal Summon to a zone it points to during the Main Phase of this turn. Co-linked monsters on its controller's field cannot be targeted by card effects. EARTH Destroys an opponent's Special Summoned monster in their Main Monster Zone. Co-linked monsters on its controller's field cannot be destroyed by card effects. DARK Shuffles a card on the field into the Deck. Its controller draws cards for their normal draw during their Draw Phase equal to the number of different "Knightmare" co-linked monsters on the field. LIGHT Sets a Spell/Trap Card in its controller's Graveyard to their field. Special Summoned monsters cannot activate their effects, unless they are linked. The most basic weakness of the Deck is the need for a discard as a cost to activate the Link monsters' Trigger Effect. Without the proper setup, this may have the player running out of resources before they can build a solid field; the "Fabled" engine may aleviate this, though. Due to the need of Special Summoning many monsters on the field in order to achieve an Extra Link, or at least having 3 or 4 "Knightmare" monsters co-linked to each other, the Deck may have disadvantage with cards like "Summon Limit", "Maxx "C"", "Vanity's Fiend", etc. Also, the "Knightmare" player must control many monsters at once for the strategy to work at its full potential, which may render the Deck vulnerable to mass-removal cards, especially "Evenly Matched", that ignores all blanket protections provided by the "Knightmare" co-linked monsters, as it neither targets nor destroys. Even if "Knightmare Corruptor Iblee" is on the opponent's field, preventing a "Kaiju" monster from disrupting the string of co-linked monsters, "The Winged Dragon of Ra - Sphere Mode" can make a much more huge impact, by removing 3 of them at once. "Knightmare Mermaid" has a ring attached to its tail which is the same as the ring on the body of "Mekk-Knight Indigo Eclipse". "Knightmare Goblin" has waist plate which is similar to the waist armor of "Mekk-Knight Green Horizon". "Knightmare Gryphon" has a spiky armor attached on its shoulders which is similar to the spike from the helmet of "Mekk-Knight Purple Nightfall". "Knightmare Unicorn" has wing-like armor in the similar fashion to "Mekk-Knight Yellow Star". "Knightmare Phoenix" has a helmet which is similar to "Mekk-Knight Red Moon". "Knightmare Cerebeus" has a jewel in the center which is similar to "Mekk-Knight Orange Sunset"
This page was last edited on 25 February 2019, at 03:43.